So, you're a pharmacist or another healthcare professional looking to update or create some standout portfolio/resume. It's tough, isn't it? I mean, look online for ideas and you will quickly get inundated with so many design ideas. My experience is some of those out there are very design heavy (hence their creation by artists and designers to showcase their work) or just look so normal. Now, I'm not saying the tried and true black and white resume with one monotone serif typography is something to shy away from, hell, it's probably the most professional one still widely accepted, but sometimes breaking from the mold is worth the risk to standout I feel. However, it's always worth knowing your audience and who you are sending material on to, and going for something that is acceptable at the end of the day should be your main goal. When I thought about creating a portfolio for myself, I outline several items that I wanted to showcase. Namely, I started with my current Curriculum Vitae and gave it a look over at what I have done and projects I have worked on that I would like to highlight. Since most positions and opportunities I seek center around writing or speaking (e.g. CEs) I look to identify a spectrum of samples to demonstrate to whomever I am approaching about my expertise and experience. Quick Biography Blurb - This includes a small one liner on who you are or an identification to go with, or a small blurb highlighting your interests/passion/expertise. Work Experience - This is pretty common, but make sure you cover your title, location, and time there. Professional Duties and Skills - Highlight skills or knowledge sets. Maybe you have experience in certain areas or skills that may stand out compared to others, like using a specific EHR system, or language skills. Awards/Honors - If they make sense I wouldn't get too detailed unless it's something that may be outside of the norm. Post-Formal Education - Certifications or other experiences you have undergone I think worth highlighting. Projects, Creations, and Accomplishments - Here I think if you engaged in something worth highlighting that demonstrates your skills and knowledge will play to your advantage. These can then be expanded into portfolio items to be detailed later. The next step after identifying what you have to present is how it's going to look. I recommend looking at some samples online, but generally, create a color scheme and choose at least two-typographies. I'm not a design expert, but generally I think a few things can be leveraged to make your resume/portfolio jump out. For color schemes, some good references include Coolor, a website/app you can use to help create a color scheme of your liking. I recommend giving it a look! For typography, there are a few free resources online if you aren't happy with what you have on your computer already. Generally these days there's a lot of options, and one thing you can use to your advantage is that may typefaces like Helvetica or Calibri have Heavy and Light options to help the flow of the type. Lastly, I like to add logos/icons to my documents. There are a few free resource online to use, like FlatIcon and TheNounProject. Sometimes icons can help a reader identify quickly what they are looking at and serve as a guide. Other items to consider is how you are going to make your portfolio/resume. I've used Microsoft Word and Publisher in the past, but now use other programs. I would love to use Adobe, but have settled on Pixelmator which is available on Mac. Lastly, there are many programs and references you can find online as guides. I use a website to buy logos and templates from (DesignCuts) and this was one product that was available that I was able to modify heavily to use. 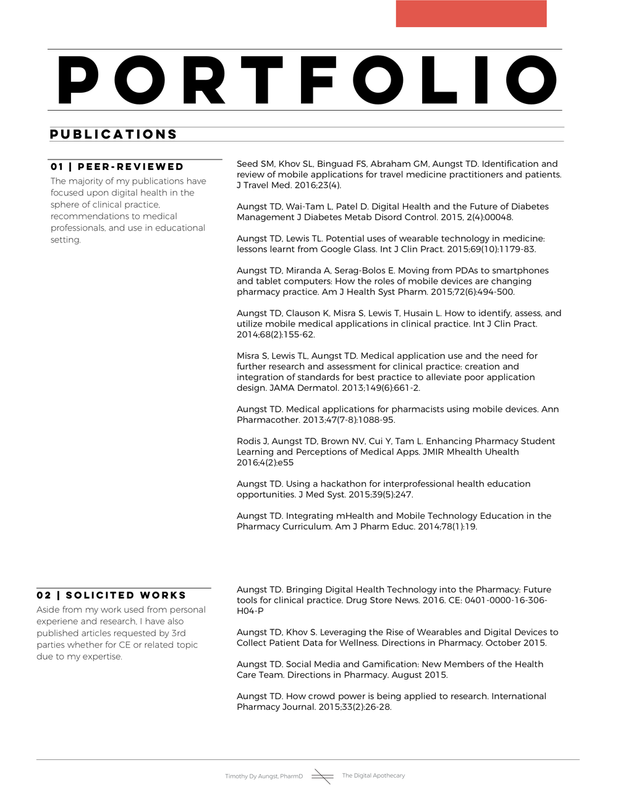 So here is my example of a one-page resume I redesigned to include in my portfolio. Obviously, It doesn't include everything, but just the parts I think matter for opportunities I am looking for. First, here is my old version, that I created about 2-years ago, and to be honest looking back on I really could have done better with. I've learned to be better over the eyars. Looking back at this thing, it's just way to busy. I really tried to slam everything I could on one page, and I really do not think I knew what I wanted to put across. This time I tried to go for a more minimal look that I could send along easily. While the one page Resume I find useful, I created other supplementary material that I put together to flesh out a full portfolio. What else can you put together to create a portfolio? Here are some samples I have created. Overall, I am happy with the progress I have made in creating this portfolio. Thus far, it has been useful when working with others looking to see what I have done, or looking for others to collaborate with or work for. Feel free to leave comments or suggestions!